I never receive any Soul Jazz Records promo stuff. Before knowing there's a new release to come through supposed-to-be informative medias, it's already available out there for share on all decent p2p networks. This time I've taken on my own schedule to visit their french distributor Discograph, grab a few news and promo CDs, and try to review, play and support some of their best labels and artists. All I got was one Soul Jazz CD-R from last November!!! No artwork, no liner notes, and the CD isn't even recognized on the Compact Disc Database (CDDB). After ten minutes of web searching, it's easy to find the "free mp3s" version of the album, and oh! surprise, the mp3s from Russian servers and such are correctly tagged... Think: it's already illegal, yet it's the only practical way to listen to music. No wonder record companies aren't managing to sell their CDs no more! Studio One Groups is the latest Soul Jazz/Studio One Records release featuring legendary groups from the foundation label of Reggae. Bob Marley and The Wailers, Toots and the Maytals, The Heptones –just three of Reggae's greatest groups who all started at Clement Dodd's Studio One Records, "The University of Reggae". 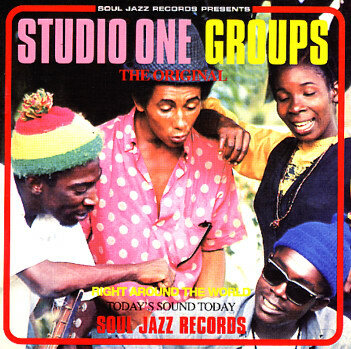 Studio One Groups brings together classic artists alongside lesser-known artists and covers Studio One's musical output from the 1960s and 70s featuring Ska, Roots, Rocksteady, Dub and more. Clement Dodd's role in launching and nurturing Reggae groups/singers is unsurpassed. Launching Bob Marley and The Wailers career also meant that Dodd both housed Marley in a flat at Studio One, and employed him to check new American 45s that came out for Studio One artists to cover. From vocal training under luminaries such as Horace Andy and Larry Marshall, to musical education (Leroy Sibbles, lead vocalist with the Heptones, became the key in-house bass player after being taught from scratch by Jackie Mittoo), Studio One's success was due to Clement Dodd's ability to see talent, surround himself with it and nurture artists. Careers were launched from even minor roles at Studio One such as Lee Perry (from handyman to singer and producer), Prince Buster (from security to singer and producer), and so forth. Studio One Groups are at the heart of the labels success. The sweet three-part harmonies, so close to the heart of Jamaican music, can be heard throughout every stylistic change of Reggae music – Ska, Rocksteady, Roots and beyond, all featured here. The album comes with exellent sleeve-notes by Rob Chapman, author of the acclaimed Studio One discography, Never Grow Old.